A county highway (also county road or county route; usually abbreviated CH or CR) is a road in the United States and in the Canadian province of Ontario that is designated and/or maintained by the county highway department. Route numbering can be determined by each county alone, by mutual agreement among counties, or by a statewide pattern. Any county-maintained road, whether or not it is given a signed number, can be called a county road. Depending on the state or province and county, these roads can be named after local geographic features, communities, or people and/or be assigned a name determined by a standardized grid reference; for example: "East 2000 Road" would be a north–south road running 20 blocks/miles/km east of the designated zero point. Many other systems are also used; some counties rather arbitrarily assign numbers to all maintained roads, but do not sign them at all or only sign them on standard street sign blades. County roads and highways vary greatly in design standards, funding and regularity of maintenance. Some county highways in urban areas are freeways or expressways. County roads that link communities or serve residential areas are often indistinguishable from state highways or residential streets. In rural areas, many county roads carry very little traffic; these roads are maintained less frequently. They may be in poor condition (if they are paved) or not paved at all. In remote areas, county roads are made of sand, gravel, or graded earth, seeing only occasional foot, equestrian, and four wheel drive traffic. Some states, such as Wisconsin, use county highways in great numbers, linking major highways and cities or towns to each other. Wisconsin also maintains a Rustic Road system where county and local routes are purposefully maintained as dirt or gravel roads in order to not interfere with natural scenery and to preserve them in their past state. In England and Wales, the term 'County Road' means a road for which the county council is the highway authority (s.29 Local Government Act 1929). 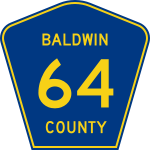 County highway markers are usually a yellow-on-blue pentagon (the Manual on Uniform Traffic Control Devices standard pattern), a black-on-white rectangle, or black text on a white rectangle (largely older signs). Some states, like Virginia and North Carolina, have no county highways in most of their counties; the state government maintains all roads in unincorporated areas. In West Virginia, the state maintains secondary roads but they are designed as county routes. Other states, like Connecticut, have no county routes because there is no government at the county level. Alaska's county-equivalent boroughs maintain roads in unincorporated areas but none are numbered; Louisiana's county equivalents are parishes, and, accordingly, have parish routes. In the United States, county highways are denoted in various ways, differing by state. 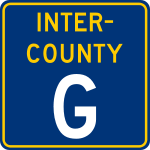 In states like Wisconsin, county highways are marked with letters—with one- to three-letter combinations (i.e. : C, CC, or CCC). Wisconsin's county highways are frequently and clearly marked at most intersections. Because the county names are non-exclusive, the state has many county roads with similar or identical names. In states like Illinois, county highways are marked either with a number (usually one or two digits), a single letter followed by a one- or two-digit number (i.e. : V-34, A-29), or in Rock Island County, with letters like Wisconsin but on a blue pentagon shield. These highways are usually marked at the beginning of the highway and marked occasionally throughout the route, but are not majorly relied on as geographic directions the way more major highways (state or interstate) are. In Iowa, county roads are marked with a single letter and a one- or two-digit number, such as B-26. In New Jersey, there are two sets of county routes, the 500-series (500–599) part of a statewide system which usually run through multiple counties, but are county-maintained, and the non-500 routes which are usually contained within a single county and are repeated between different counties. The latter generally use numbers in the 600-series (600–699) and some counties have routes in the 700s (700-799) along with one route in the 800s. Two counties, Bergen and Monmouth, along with some routes in Ocean County, have routes outside this range with one- or two-digit numbers along with some numbers in the 100s. In New Jersey, county routes are usually signed just as well as state routes, including mile or half-mileposts, and appearances on freeway exit signage. In Minnesota, some county roads are known as county state aid highways. These roads are constructed and maintained by counties, but they are eligible for funding from the County State Aid Highway Fund. Differences in signage between CSAH routes and other county roads depends on the county. Some counties, such as Stearns County, delineate between the two by using the standard blue pentagon shield for CSAH routes and Minnesota's normal white square shield for other county roads. 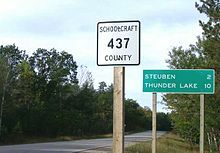 Most county roads in Minnesota are designated with numbers, although a few non-CSAHs in Dodge County utilize letters instead. A few roads that cross county borders are also signed with an inter-county designation and a letter, but this system is not shown on most maps. Many counties in Ohio use markers to designate county roads, but the signage of Ohio's county roads vary widely in construction, signage, and naming from county to county. Seneca County uses the default blue pentagon marker and uses limited signage (only post-intersectional signage as a general rule), while Logan County uses a square white shield with a black border (similar to the St. Louis County design in Missouri), and signage is nearly comparable to state route signage, with advance signage of intersections with county roads and termini, and Scioto County uses a shield with a county outline. In Canada, numbered county roads are only found in Ontario, where they are similar to American county highways. Ontario county or regional roads are marked with trapezoid-shaped signs, usually (but not necessarily) with a white, green, or blue background, and normally identifying the county or region responsible for the road's maintenance, sometimes with the jurisdiction's coat of arms or corporate logo. The county road network has been present for many years, but has only been signed with the flowerpot logos since the 1970s and early 1980s (depending on the area). Previously, the roads simply had road names, such as "Essex Road 42" or "Kent County Road 14", and so on, but had no shields to designate them. Many Ontario county roads are built to provincial highway standards, as thousands of kilometres of highways were downloaded from the province to counties and regional municipalities in 1997 and 1998, and most of the downloaded highways were rolled into the county road systems. In some situations, these in turn were downloaded from the region/county to the local municipalities. Not all jurisdictions in Ontario which maintain a county road system use the name "County Road" to designate them, however — depending on the type of census division which maintains them, they may also be designated as a Regional Road, Municipal Road, Regional/County Highway, District Road or City Road. In the unincorporated districts of Northern Ontario, as there is no county level of government the province maintains a secondary highway system to serve the same function. In addition to county roads, many townships also have concession roads and township roads, such as Colchester South Road 3, and Concession 8. These usually do not have shields (only names on signs and maps). One exception is former Highway 620. It was downloaded to the Peterborough and Hastings County governments, and in one section, the highway was downloaded further to the township of Wollaston, and is now signed as "Wollaston Township 620", with a municipal sign similar to an Ontario Tertiary Highway. A number of townships in Wellington County sign their township road system in a similar manner. County/Regional roads in Ontario are styled by this basic "Flowerpot" design. This shield is of York Regional Road 8. Niagara Regional Road 20 shield. While Niagara generally conforms to the standard Ontario "flowerpot" design, the shields are white-on-blue rather than the more traditional black-on-white and have rounded corners. Essex County Road 22 Shield, a typical county road shield in Essex County, Ontario. 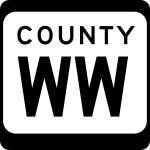 Wikimedia Commons has media related to Diagrams of county route markers. ^ "Local Government Act 1929" (PDF). Retrieved 2011-12-03. ^ "West Virginia Division of Highways Factbook" (PDF). 2002. ^ Froehlig, Adam. "Twin Cities Highways: Definitions and Acronyms". Retrieved 2006-03-28. This page was last edited on 10 February 2019, at 22:27 (UTC).